In 2013, the U.S. Geological Survey (USGS), in cooperation with the U. S. Department of the Army, compiled available precipitation and streamflow data for the years of 2008–2012 from the Fort Carson Military Reservation (Fort Carson) near Colorado Springs, Colo., and precipitation, streamflow, and suspended-sediment loads from the Piñon Canyon Maneuver Site (PCMS) near Trinidad, Colo. Graphical representations of the data presented herein are a continuation of work completed by the USGS in 2008 to gain a better understanding of spatial and temporal trends within the hydrologic data. Precipitation stations at Fort Carson and the PCMS were divided into groups based on their land-surface altitude (LSA) to determine if there is a spatial difference in precipitation amounts based on LSA for either military facility. Two-sample t-tests and Wilcoxon rank-sum tests indicated statistically significant differences exist between precipitation values at different groups for Fort Carson but not for the PCMS. All five precipitation stations at Fort Carson exhibit a decrease in median daily total precipitation from years 2002–2007 to 2008–2012. For the PCMS, median precipitation values decreased from the first study period to the second for the 13 stations monitored year-round except for Burson and Big Hills. Mean streamflow for 2008–2012 is less than mean streamflow for 1983–2007 for all stream-gaging stations at Fort Carson and at the PCMS. During the study period, each of the stream-gaging stations within the tributary channels at the PCMS accounted for less than three percent of the total streamflow at the Purgatoire River at Rock Crossing gage. 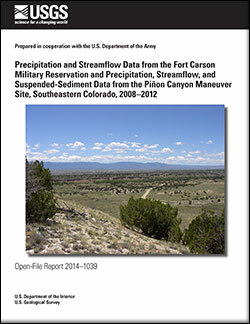 Peak streamflow for 2008–2012 is less than peak streamflow for 2002–2007 at both Fort Carson and the PCMS. At the PCMS, mean suspended-sediment yield for 2008–2012 increased by 54 percent in comparison to the mean yield for 2002–2007. This increase is likely related to the destruction of groundcover by a series of wildfires within the PCMS in 2008 and 2011. Brown, C.R., 2014, Precipitation and streamflow data from the Fort Carson Military Reservation and precipitation, streamflow, and suspended-sediment data from the Piñon Canyon Maneuver Site, Southeastern Colorado, 2008–2012: U.S. Geological Survey Open-File Report 2014–1039, 39 p., https://dx.doi.org/10.3133/ofr20141039.